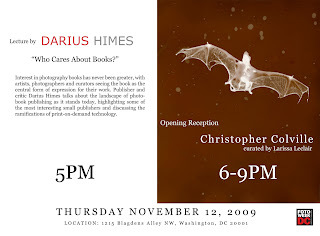 In his first solo show in Washington, D.C., Christopher Colville, an Arizona-based photographer explores the themes of time as manifested in death and memory in a selection of work curated by Larissa Leclair from his series Emanations, the Sonoran Project, and Iceland Trilogy. Colville embraces traditional and experimental processes, such as photograms, ambrotypes, and decay-generated images in his contemporary photographic work. For more information, please contact Larissa Leclair: contact@larissaleclair.com. Hours: Wednesday – Friday, 10-2pm, and by appointment. - Interest in photography books has never been greater, with artists, photographers and curators seeing the book as the central form of expression for their work. Publisher and critic Darius Himes talks about the landscape of photobook publishing as it stands today, highlighting some of the most interesting small publishers and discussing the ramifications of print-on-demand technology.